It probably is, as the author suggests, “the most important, powerful institution in the world.” A better understanding of the ongoing errant behavior of this centenarian creature of Congress is the goal of Fed Up. It’s the system, man. The Federal Reserve System, its official name. You may know it as the Federal Reserve. Or simply The Fed. And if it wasn’t misbehaving, that might have made for a different book title . . .
One of the biggest errors of the Fed, says DiMartino Booth, was its December 16, 2008 move toward a Zero Interest Rate Policy (ZIRP) on the Fed funds rate–paid by banks to banks. (Chap 1.) The Fed funds rate also affects the Prime rate, paid by bank consumers and the interest rates paid to savers. 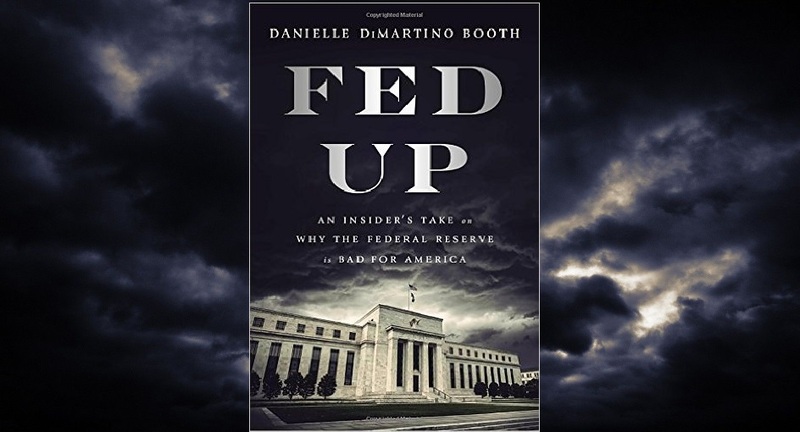 At this time DiMartino Booth was already working for the Research Department of the Dallas Fed, which gave her a unique insider’s view of the behind-the-scenes action. While the ZIRP prescription seemed to work, with the U.S. “officially” out of the recession by the middle of 2009, the zero interest rate policy didn’t change until the end of 2015. Things can move sooo slowly at the Fed . . . In the mean time, savers, especially retirees, are cheated out of billions of dollars, year after year. And inefficient zombie corporations are being kept alive well past their natural lifespan, helping to create a drag on the economy. Equally disturbing was the Fed’s veil of secrecy in making $3.3 trillion dollars in loans to Wall Street (Chap 14), all the while tightening credit requirements to Main Street. I can still recall all the controversy in 1979 surrounding the so-called Chrysler Bailout. One loan to one company. All kinds of concessions were required by both labor and management and no one was happy at the time. Flash forward to the beginning of the Great Recession and thousands of loans were made in secret to some of the biggest corporations and banks in the world, and yet where were the so-called public defenders? Another ill-effect of current Fed policy is an inflation rate running ahead of wage increases. A cart of groceries can cost a family hundreds of dollars. Not to worry, the Fed’s economists (their numbers are legion), don’t bother to calculate the cost of food (or fuel) in their economic models, so why should we? A local insurance agent tells me a number of folks on fixed incomes have let their home insurance lapse in order to pay more pressing bills. Say what? This would be what is considered anecdotal evidence by the Fed, not worthy of their high and mighty data sets. Danielle DiMartino Booth concludes with suggestions for a more streamlined Federal Reserve System. Congress needs to end the Fed’s dual mandate of price stability and maximum employment (price, per se, is simply information), and focus on stabilizing the buying power of the U.S. dollar. The Fed needs to stop its manipulation of the currency (via inflation) to jolt savers into spending money. In short, the Fed is in need of some serious, serious reform. I agree and recommend reading Fed Up to anyone wanting to learn more on how the U.S. economy arrived at its current–depending on who you ask–stagnate state, and what is needed to insure it is able to move forward now and in the future. Disclaimer: A copy of the book was provided by the author.